State-owned Congolese company Cominiere holds 30% of Manono and the deposit was mined for tin for six decades until 1982. AVZ's latest resource estimate also includes 300kt of tin and 13.2kt of tantalum. The company hopes to update its October scoping study before the end of year and AVZ is now studying a 5mtpa and 10mtpa operation (up from 2mtpa) thanks to the expanded resource and offsets provided by tin and tantalum. 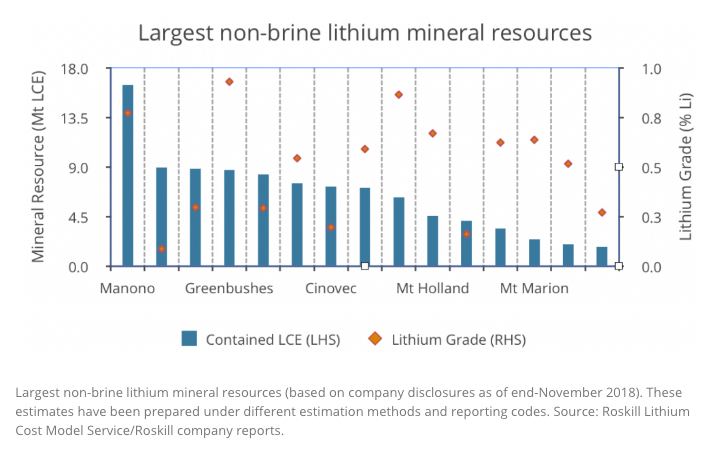 London-based research consultants Roskill says an operation at Manono with a 10 million tonnes per year capacity has the potential to produce over 300,000 tonnes per year of lithium carbonate equivalent. “An expanded processing capacity will ultimately bring some cost saving to the project through economies of scale, however, in our view the project’s main hurdle remains its location and the costs involved with transporting its concentrate to market. There is of course a long road ahead for AVZ at Manono and like many of its peers, the $110m stock has come under pressure from the fall in the price of lithium. The sector is a crowded field, but AVZ does enjoy some high-profile backers with Citicorp, JP Morgan and BNP Paribas together holding some 30% of the company. Unlike cobalt, lithium escaped being treated as a strategic mineral by the Congolese authorities and royalty rates for the battery raw material remains at 3.5%. Cobalt now attracts a 10% rate.